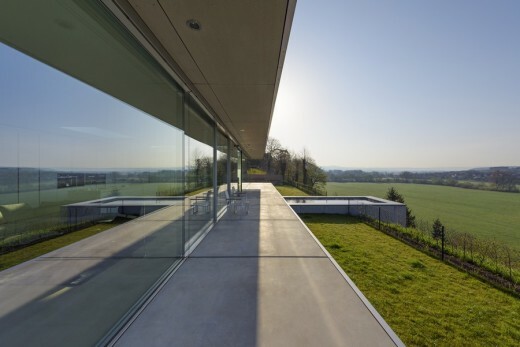 Villa K, located in Thüringen, is the first German project for Paul de Ruiter Architects. The realization of a sustainable villa, discrete and integrated in the natural environment, was the wish of the client. The result is a straightforward, but innovative residence built from only glass, steel and concrete. Living space The sustainable house is oriented towards the south, this is where the living- and bedrooms are situated. A glass façade, stretching from roof to floor, demarcates the living areas. 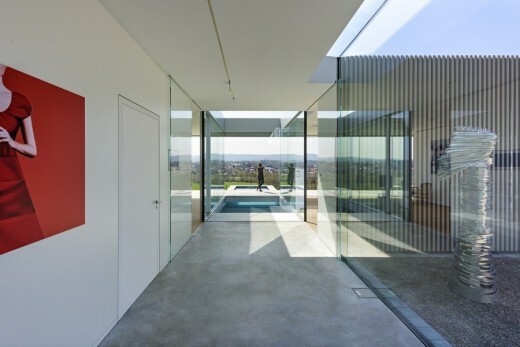 The glass façade, without disruptions such as windows or outdoor sun blinds, reflects nothing but the air and offers amazing views over the valley. Around the living area a U-shaped terrace is situated. The middle of the terrace is crossed by a partly indoor patio and a pool that seems to float above the hill. Through the addition of a lifting platform across the pool, the terrace visually appears to continue. This platform can be pulled up when deciding to go for a swim. Around the terrace a garden is arranged with vegetable crops and fruit trees, through which the owner is able to harvest his own yield on this special location up in the mountains. Unity with the mountain scenery The entrance, technical areas, pantry, hunting room and garage with room for six cars are located on the north side, moved into the slope of the mountain. The complete roof structure of the villa is covered with moss and sedum. This reduces the cooling load and seen from a higher situated area, this green roof makes the villa to blend into the natural environment due. Above the garage and the entrance solar cells are placed, directed to the south to provide the villa with energy. A climatologically interesting and sustainable situation is created through the orientation towards the south and by placing a large part of the house into the mountain slope. The south side receives large amounts of sunlight and warmth, while the ‘subterranean’ part of the house contains cold air. A heat exchanger implemented in the villa collects this warm and cold air and transports it to the heat pump. The heat pump stores cold air to cool in the summer and saves warm air to heat the house during winter times. This system is connected to a cooling ceiling and underfloor heating, which guarantees a comfortable living climate every day of the year. A delicate and completely computerized computer system steers these stainable heating and cooling systems.